Both band and song, I’m sure are well-known by all. Everyone knows the Kooks; it would just be a waste of space for me to introduce them. 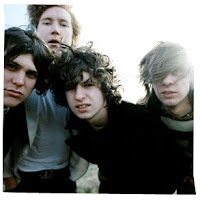 Anyway, the Kooks are a pretty popular UK indie-rock band and those who know ‘em is sure to love ‘em. And I’m sure everyone knows the song ‘Crazy’ that was originally sang by Gnarls Barkley. Nelly Furtado has also done a cover version of this song, but knowing Nelly Furtado, and after doing the math, I thought her version would be predictable. But hearing the Kooks singing ‘Crazy’ is pretty good. The song is stripped and it sounds a lot more accessible. Exchanging the dance version with a guitar and sang acoustically could’ve been one of the most brilliant ideas ever. Luke Pritchard’s singing with the obvious accent just adds to the quirkiness of the tune. A cover worth giving a listen to.